A.I. 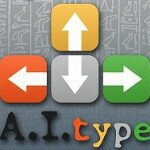 type is an app in beta mode, available for free from the Android Market. In combination with the Gingerbread keyboard and an Android phone running 2.2 or higher, the app increases your typing speed by making auto-corrections and also by guessing what word you will type next. According to the developer, using A.I. type can save you 75% of the number of keystrokes normally used when typing..
Because the app reaches into the clouds for information, the software doesn't require much storage space. We installed it on a Motorola DROID and found that the program works as advertised. As you are writing a sentence, the program suggests the next word. Just click on the correct word and you have just saved yourself a number of key strokes. The app also supports multiple languages and voice recognition. If you are familiar with the Swiftkey keyboard, you will find A.I. to be somewhat similar. The difference is that the former comes with its own QWERTY keyboard while the latter uses the Gingerbread QWERTY. If you're not sure about downloading the app, you can check out the video below. the world doesnt want predictive text that can spell words properly.... thats why we break everything down OMG FML ROTFLOL. seriously... the apps are so good we can be soooo lazy to not only be able to spell correctly, but to not even need to think of what word is next.... we are soooo lazyyyy but yet we STILL use short form and f4ck the languages to hell.... we need an apps that makes teachers teach, parents parent and students study. otherwise, soon dots in brail will be a chore.